Until Oregon’s recent payback win over Stanford, when the Ducks shot 48% from the field, its outside shooting woes and stagnant offensive production have been well-chronicled, especially in the nine-game absence of point guard Dominic Artis. Stanford initiated this defensive plan with great results a month ago in Palo Alto, and every team Oregon has faced since has tried some version of it with various degrees of success. That is, until Jonathan Loyd went off for his best game of the season in the rematch against the Cardinal last week. While one might bemoan the recent offensive struggles of this squad, one thing is very clear. This Oregon team can play defense. With one exception (the Stanford loss), the Ducks have defended at a high level every night out. It is the main reason that Oregon stands in first place in the Pac-12 with three games to go. It has kept them in games when the ball simply wouldn’t go in the hole. Loyd and Woods team up for a steal and score: I want to illustrate a remarkable play that occurred midway through the second half, right after Stanford star Dwight Powell returned to the game with four fouls as the Ducks were steadily pulling ahead. It represents the determination and effort that was evident all game and it revved up the sold-out Matt Knight Arena to a feverish pitch. Jonathan Loyd knocks the ball away from Stanford’s Christian Sanders. (Above): With Stanford on offense, Loyd reaches in and knocks the ball loose from Christian Sanders and it rolls toward the sideline (green dotted arrow). Loyd and Sanders both scramble after the ball. 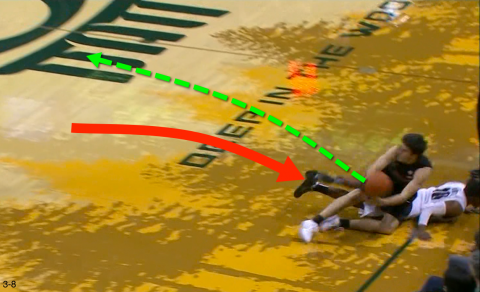 (Above): Loyd dives headfirst out of bounds as he attempts to recover the ball (red arrow), but Sanders flips it back into the court (green dotted arrow). Note Loyd’s prone position, because he pops up instantly and hustles back on the court to help finish the play. Tony Woods flies into the action as he dives to bat the ball forward. 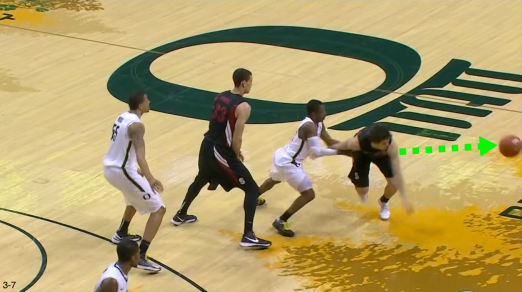 (Above): Tony Woods dives to the floor (red arrow) and collides with Powell, but manages to deflect the ball off Powell toward the Oregon basket and right into Loyd’s hands (green dotted arrow). The ball finds Loyd, who makes tracks to the open hoop. (Above): Wood’s hustle was rewarded as Loyd catches the tipped ball in the air and heads for the other end (red arrow). Loyd finishes strong over Josh Huestis. 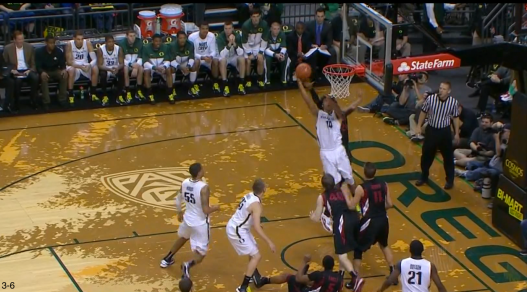 (Above): The 5’7″ Loyd takes the ball the length of the court for a big-time finish over Stanford’s 6’7″ Josh Huestis. The bucket gave Oregon a 12-point lead in the game. From there, it was all Oregon. Oregon dominated the second half of the game. The Ducks turned the contest into a lopsided affair by out-hustling and overwhelming the Cardinal, collecting 12 steals and forcing 17 turnovers (for the game), while scoring 25 points as a result. Their high level of intensity on defense completely did in Stanford, which in turn, allowed Oregon to run free and easy and play transition basketball, attacking the hoop, kicking the ball out to the perimeter, and then attacking the basket again by making natural, instinctive basketball plays without setting up in a prescribed play. The Ducks took full advantage. Running the Break in Transition: The second play that I’m going to illustrate also came in the second half of the Stanford win. 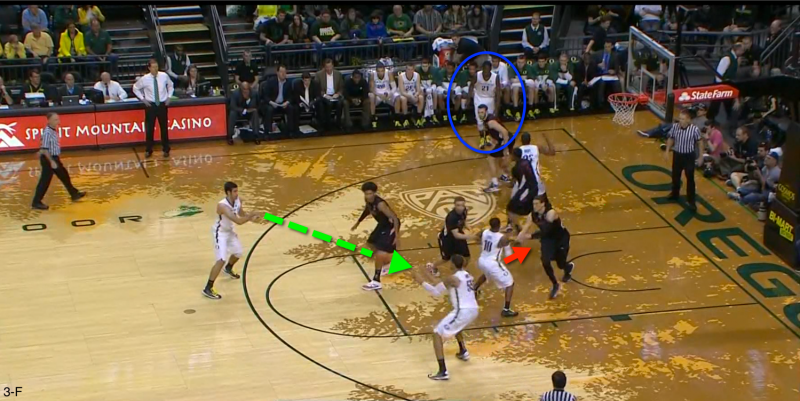 It is an example of Oregon having offensive success without actually setting up an offensive set. It shows that you don’t have to score directly on the break to still make instinctive plays that bring a successful result. 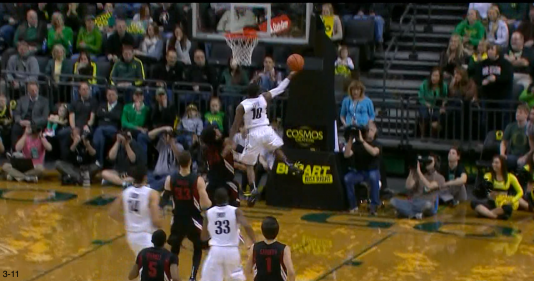 Loyd starts an Oregon fast break with a pass to Damyean Dotson. 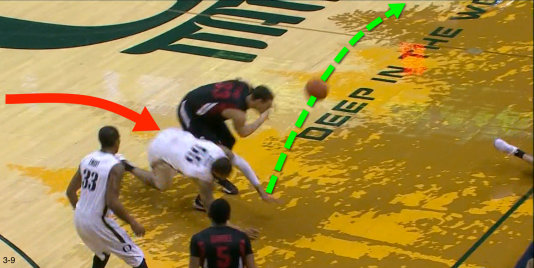 (Above): After receiving the outlet from Woods, who rebounded a Stanford missed shot, Loyd passes quickly (green dotted arrow) to a streaking Damyean Dotson on the left sideline (red arrow). After receiving pass, Dotson immediately attacks the basket. 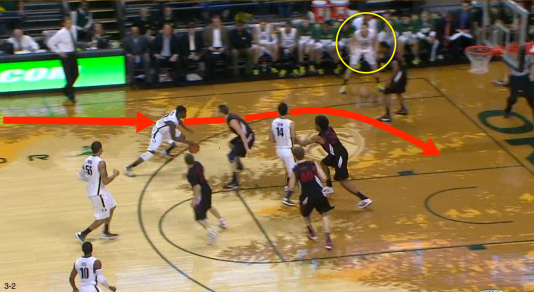 (Above): Dotson takes the ball hard down the sideline and attacks the basket from the wing (red arrow). Note Singler in the corner (yellow circle). He becomes a passing target for Dotson. Dotson fires a pass to an open Singler in the corner, setting up for a shot. (Above): After Dotson’s drive to the hoop was thwarted, he passes to Singler, who is open in the corner (dotted green arrow). Singler’s defender closes quickly (orange arrow). After passing, Dotson will move to rebounding positon (red arrow). Note Arsalan Kazemi (blue circle), who becomes open when his man goes to help on defense. Singler attacks the basket when he doesn’t have an open shot. (Above): When Chasson Randle closes out too hard on Singler in the corner, he promptly goes by him and attacks the hoop (red arrow). Dotson moves to rebound (yellow arrow), and Kazemi’s man (blue circle) moves to stop Singler, leaving Kazemi wide open. Singler flips a pass to an unguarded Arsalan Kazemi. (Above): When his drive to the hoop runs into into a double-team, Singler alertly drops the ball over Huestis to a wide-open Kazemi (green dotted arrow). Kazemi scores an easy hoop on Singler’s assist. 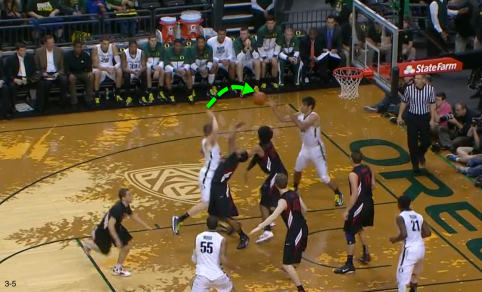 (Above): Kazemi finishes the easy score for one of his 15 points on the pass from Singler as the Ducks continued to roll. “We want to score any way we can, and transition’s been very good to us,” Altman said. After 28 games, this team has proven that competing on the defensive end gives them a chance every night. As tournament time approaches, that’s a comforting thought.